Good lord, Northern Ireland. One truck, carrying a whole bunch of mackerel dumps the load into the grimy, gross street, and you lot all go running to pick it up like lunch has just been served. It's gotten to the point where your city needed to say something about it. Get it together. You all (and by you all, I mean "humanity") remember what a street looks like, right? Just a dark gray cesspit of literal filth and scum? Great, glad your memory is working. That memory apparently does not function in parts of Belfast, because the locals think the phrase "street meat" actually comes from the goddamn street. Either that, or Belfast has remarkably clean streets, in which case, I deeply apologize, I was wrong, and I applaud and commend your city's commitment to a brighter future. Belfast City Council is advising its citizens: Don't eat fish found lying on the roadside. They're too fishy. 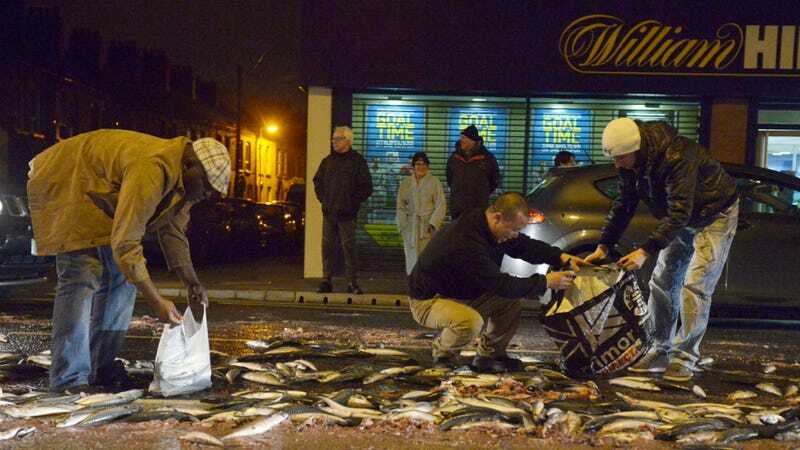 Tuesday's health warning follows the accidental dumping of thousands of mackerel on to the busy Ravenhill Road, apparently by a delivery truck with a loose back door. Locals grabbed bags to haul in their catch before passing cars could turn the stranded school to pulp. "Oh, only 100 cars have driven through this fishy, foul smelling mess?" the denizens of Belfast are probably reported to have said. "Might as well grab this up before another 100 pass!" Tommy Bardsley says he bagged 25 mackerel and deemed them off-the-boat fresh. "I know fish," the 61-year-old declared. Well, he knows fish. I guess that settles that then. Gorge yourselves to your digestive tract's malcontent. It's probably better than an old slot jockey, anyway.